In 1950, when Edward R. Murrow convinced Walter Cronkite to join CBS News, the television news industry was still in its infancy. Nineteen years later, Cronkite left the network's anchor desk as one of the most trusted names in America and the primary news source for millions of Americans. When Cronkite came to television, he brought with him a journalistic reputation and personal respectability that the medium desperately needed. A newsman since 1935, he distinguished himself through his coverage of World War II. Embedded with the 101 Airborne unit, he covered the harrowing Operation Market-Garden landing in the Netherlands, the Battle of the Bulge, and the Nuremberg trials. After the war, he stuck with United Press, becoming the company's main reporter in Moscow. In 1950, broadcast news was still an immature medium that was widely regarded with condescension. 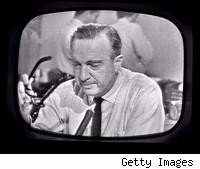 In fact, although Murrow aggressively courted Cronkite on behalf of CBS, the famed broadcaster was himself concerned with what he perceived as the medium's emphasis on images over ideas. Cronkite, however, transformed the news, employing the uniquely intimate nature of television to bring viewers into ever-closer contact with the people and events that influenced their lives. When Cronkite provided the first televised coverage of the Democratic and Republican national Presidential conventions in 1952, CBS execs coined the term "anchor" to convey his position as a stabilizing force in the network's presentation. The term stuck, as Cronkite racked up more and more firsts: closely involved with the space program, he introduced viewers to the astronauts in the Mercury, Gemini and Apollo programs. In 1960, he hosted the first televised coverage of the Olympics and, in that decade, also offered in-depth coverage of the Kennedy assassination and Vietnam war. Vietnam was a particularly significant event in Cronkite's broadcast career. Initially a supporter of the war, his dire, dark coverage of the Tet offensive in 1968led him to conclude, on-air, that "It seems now more certain than ever that the bloody experience of Vietnam is to end in a stalemate . . . It is increasingly clear that the only rational way out then will be to negotiate, not as victors, but as an honorable people who lived up to their pledge to defend Democracy, and did the best they could." President Lyndon Johnson subsequently cited the broadcast as part of his justification for not seeking office in 1968. Given his monumental contributions to television news, Cronkite's numerous Peabody broadcasting awards and induction into the Academy of Television Arts and Sciences Hall of Fame are almost anticlimactic. However, the Presidential Medal of Freedom that he received from Jimmy Carter and the "Ambassador of Exploration" award that NASA gave him indicate some measure of his impact upon American culture. In the end, Cronkite didn't just report the news; he helped change the way that America experienced it. With journalism poised to take another turn from the dry pages of newsprint and the flat, distant images of television, it is worthwhile to consider Cronkite not as a once-relevant reporter, but rather as a transformative figure who took an under-appreciated medium, recognized its unique strengths, and used it to connect with his audience on a heretofore-unrealized level of intimacy. In this, his significance lives on.